It seems every household has a change jar. 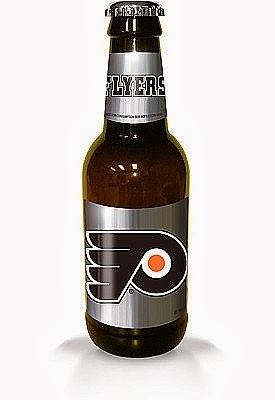 A tupperware bowl, a tin canister, a flour jar, a piggy bank, or, in our case, a three foot high, plastic container shaped like a beer bottle and decorated with a Philadelphia Flyers hockey logo. Steadily, day by day, my husband Bob and I threw our spare quarters, nickels, and dimes into the change jar, until the sea of coins began to slowly ascend towards the rim. We were saving for something....anything! A rainy day! A vacation! A new car! A new home! Retirement! More change! More change! More change! Bob even started to throw dollar bills into the change jar. Then $5 bills, and (gasp!) he even parted with a $20 now and then. Finally, last month, as a family vacation beckoned, we decided that the contents of the change jar could provide some much-needed financial assistance. That is why, on a summer evening, the neighbors gave strange looks to Bob, my 16-year old daughter Melissa, and me as we struggled to carry the 3,964 pound change jar to our car and place it gently in the trunk. Onlookers continued to stare as we took our "treasure" out of the trunk and lugged it into the bank, where we exchanged enough coins to fill a baseball stadium ( or so it seemed) for crisp, clean paper money. Yes, three years of emptying our wallets of coins had certainly paid off! We now had some unexpected cash that could surely be used to enhance our week-long stay in the Great Smokey Mountains of Tennessee. Thank you to the change jar!! It had not been the first time that Bob and I reaped the rewards of our "sophisticated" saving plan. As we left the bank, I thought back to a time, long ago, when the money in the change jar gave us a gift much more valuable than vacation spending money. Towards the middle of a difficult pregnancy that left me confined to bed and quite ill for several weeks, I finally felt well enough to take a temporary job as a receptionist at a library at Princeton University. We had recently relocated to central New Jersey after spending 18 months living in Queens, NY. Bob, looking to reinvent himself, had changed his career and now worked in a sales job that had, as yet, failed to deliver on its promise of huge commissions. Our income barely covered the rent, let alone car insurance, the electric bill, the phone bill, the water bill, and a staggering amount of credit card debt that threatened to suffocate our future. Reluctantly, we traded in the car we loved to avoid the monthly payments. Week after week, we sat at the kitchen table, the stack of bills piled high, the check book in hand, as we determined which lucky utility or creditor would get paid that month. Our financial situation reached its lowest point when Bob and I discovered we barely had enough for our next meal. We had no choice but to turn to the change jar, which yielded a welcome $75. Certainly not a windfall, but enough for the basics - milk, bread, eggs, cereal, and meat. In short....enough to get by. The lack of money caused worry, and stress, and yes, of course, a few tears. We were poor. Yet.........we were happy. We were young. We were in love We were waiting in anticipation for our baby Melissa to enter our lives. Today, we're not quite so young anymore. Our "baby" is now in high school. Our two full-time jobs provide the financial security that allows us to use the coins from our change jar to fund a vacation, instead of food. And still very much in love! Our Flyers "beer bottle" change jar yielded enough nickles, dimes, and quarters to help pay for a family vacation! As we remember the heartbreaking events of September 11, 2001, I am honored to repeat a blog I first posted last year. In meteorological terms, we had stumbled upon a picture perfect day. Much like the weather that had greeted an eerily similar Tuesday morning, on September 11, 2001. What's more, my step-daughter Jessica, at the beginning of what has evolved into a successful career in political and grassroots advocacy, had been in New York on that beautiful Tuesday morning working on a local election. We were somewhat sure that her destination did not involve the World Trade Center, but still....unbridled fear filled our hears. Melissa and me in New York City in front of the Christmas tree at Rockefeller Center, December, 2011 - thousands came to New York City a mere three months after 9/11...the terrorists did not win, life went on. I originally wrote this post in February, 2012, when my now 16-year old daughter Melissa was in 8th grade. As she prepares to start her sophomore year of high school, the words I wrote nearly two years ago still hold true. I dedicate this post to all the moms and dads out there who will watch their cherubs get on the school bus this week. Whether it is for the first time, or, in my case, the 10th....the emotions that come with letting go never change. Yes, the first day of kindergarten had arrived, and my six-year old daughter Melissa brimmed with excitement, a precious cherub waiting to embark on her newest adventure. She skipped along between my husband Bob and me as we made our way to the bus stop, at least 20 minutes early. I soaked in her emotions, while keeping my own in check. The anticipation of the first day reigned supreme among the handful of kids who greeted her at the corner. With camera in hand, I snapped still poses, while my next door neighbor Angelica shot video footage of her son Christopher, who would be in Melissa’s class. At long last, or all too soon, depending on your perspective, the school bus arrived. We paused for a moment to let the older students climb on first. Christopher boarded next, jumping the stairs and taking his rightful place among the big kids. Then came Melissa’s turn. She stopped half way up the steps and, in response to my pleas, turned and gave me one more smile. Although the camera lens captured the scene, I need not have bothered taking photos. The moment has been burned into my memory forever. The bus pulled away and I stood there, watching, finally allowing my own feelings to swim to the surface. I dabbed at the tears in my eyes, wondering just how many times I would experience this strange sort of melancholy every time Melissa passed through another milestone in her young life. 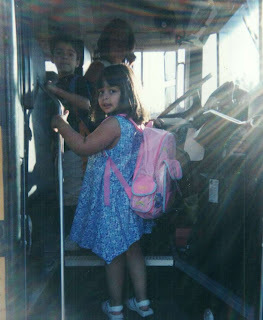 The next day, despite our best laid plans, instead of being at the bus 20 minutes early, we were still gulping down breakfast, and running through the house, making sure we had everything we needed for “Kindergarten: Day 2”. Bob shouted words of encouragement, hoping to motivate us to move faster, yet his effort was all for naught. This time, the tears that flowed were Melissa’s as we watched the bus pull away, minus one member of its precious cargo. “Mommy can drive you to school day,” I said reassuringly as I wrapped her in my warm embrace. Soon enough, I found myself walking my baby into the office of her elementary school. The secretary greeted me with a brusque smile, and asked the reason for the lateness. Great, I thought. They are going to bestow the mother of the year award on me right now. How was I going to handle 12 years of schooling for this child when I couldn’t even get her out the door on time for the second day of kindergarten? I certainly appreciated her kindness, but walking my daughter to class ranked as the number one, top priority on my to do list at that moment. I wanted that honor, not some unknown school administrator! “Mrs. Weinstein, we really ask that the parents don’t walk the kids to class, it helps them to get used to their new environment,” came her text book reply. With that, she took my daughter’s hand and off they went. I stood there in the hallway….frozen…. watching them walk away toward Melissa’s classroom….away from the office….. away from me…. Wait. What? NO! That’s my baby you are taking away! THAT’S MY BABY! I wondered if I would ever learn to let her go. Eight years later, I still wonder. Melissa, who is now in 8th grade, has no longer granted permission for her mother to accompany her at the bus stop. The strict rules allow me to walk outside with her and chat for a few minutes, however, as soon as the bus turns the corner and her fellow classmates get any inkling that she might be standing there with (gasp!) her mother, I must retreat back inside the house. I break this rule quite often, retreating only to our front porch where I stand until I am absolutely, positively sure she is safely on the bus and on her way to school. This constant rule breaking is often met with scolding from my teenage offspring. “Mom, the little 6th grader down the block doesn’t even have her mother wait at the bus with her!” she yelled in exasperation. I’m not sure why I can’t let her go. I am gripped with some irrational fear that if I do not actually witness her stepping onto the bus, something will go wrong, she’ll be in harm’s way, and it will be beyond my control to do anything about it. I try to explain that I worry out of love, which just leads to more exasperation on her part. She assures me that she is fine, and deep down, I know she is right. This morning, I tried to follow the rules. Indeed, I removed myself from the vicinity of the bus stop and went back into the house within the designated time frame. But the rules couldn’t stop me from watching out the window until I knew she was safe. Next year, high school beckons, and four years after that, college. It’s ok though. I’m going to stow away under the bed in her dorm room. She won’t even suspect I’m there. When will I let her go? The answer is quite simple. Never. 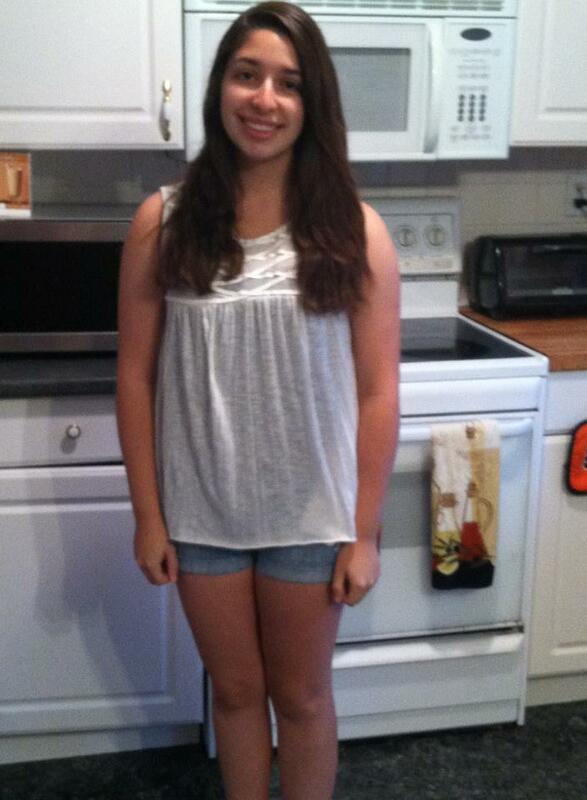 Melissa on her first day of 10th grade! As Melissa followed Chris onto the bus, she turned to give me one last hesitant smile before she embarked on her journey to her first day of kindergarten. This week she will start her sophomore year of high school.....10 years later, it's still so hard to let her go! To my readers, can you tell me in the comments section below how you found my blog? Thanks so much!